Here it is, my final Family Home Evening lesson of my series based on the Gospel Principles manual, #47/47: Exaltation. Following this FHE, I will be starting a Book of Mormon lesson series. Lesson: When we lived with our Heavenly Father, He explained a plan for our progression. We could become like Him, an exalted being. The plan required that we be separated from Him and come to earth. This separation was necessary to prove whether we would obey our Father’s commandments even though we were no longer in His presence. The plan provided that when earth life ended, we would be judged and rewarded according to the degree of our faith and obedience. 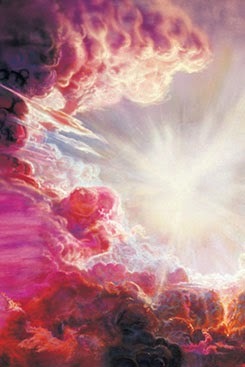 Exaltation is eternal life, the kind of life God lives. He lives in great glory. He is perfect. He possesses all knowledge and all wisdom. He is the Father of spirit children. He is a creator. We can become like our Heavenly Father. This is exaltation. Exaltation is the greatest gift that Heavenly Father can give His children (see D&C 14:7). They shall increase in knowledge, wisdom, and power, going from grace to grace, until the fulness of the perfect day shall burst upon them” (see D&C 132:19–20). 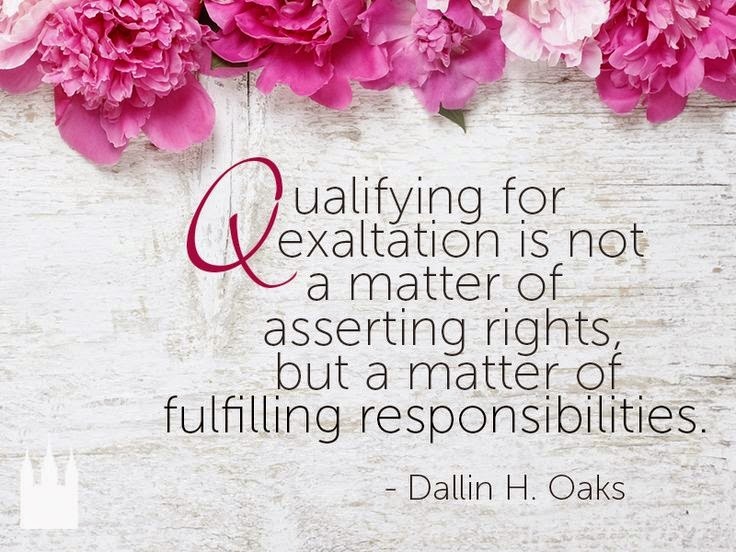 So how do we qualify for exaltation? We first must place our faith in Jesus Christ and then endure in that faith to the end of our lives. Our faith in Him must be such that we repent of our sins and obey His commandments. He commands us all to receive certain ordinances: baptism, the gift of the Holy Ghost, the priesthood for the brethren, temple endowment, and temple sealing. Attend our Church meetings as regularly as possible so we can renew our baptismal covenants by partaking of the sacrament. Finally, each of us needs to receive the Holy Ghost and learn to follow His direction in our individual lives. The Lord has said, “If you keep my commandments and endure to the end you shall have eternal life, which gift is the greatest of all the gifts of God” (D&C 14:7). President Joseph Fielding Smith said, “If we will continue in God; that is, keep his commandments, worship him and live his truth; then the time will come when we shall be bathed in the fulness of truth, which shall grow brighter and brighter until the perfect day” (Doctrines of Salvation, 2:36). Activity: We played exaltation coin toss! I set up 6 cups in a row with all the cups turned upside down except the first one. By the last cup, I placed a picture of Christ, our family, and the temple to represent exaltation--the goal of the game. Starting from the first, the cups were labeled: baptism, gift of the Holy Ghost, sacrament, temple ordinances, temple sealing, and endure to the end. June then had to make a coin in each cup. As she made a coin in the first cup, I flipped over the next one, since you can't skip through ordinances. 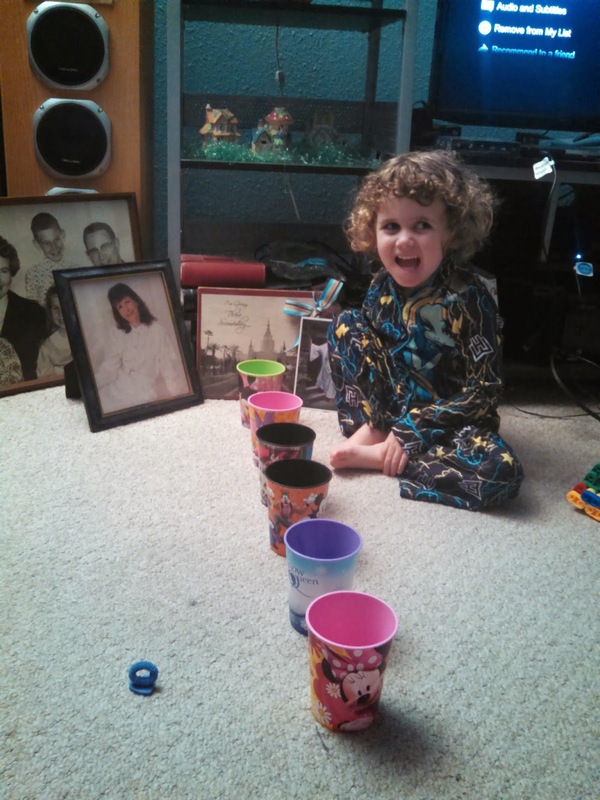 As the cups got farther away, she found it harder to make them into the right cup. I explained to her how it can feel harder to make and keep our covenants as the world tries to distance us from the Lord, but if we keep trying and have our sights set on the temple, we can make it. Soon enough, she had made her coins into all the cups. She liked the game so much that we played four or five times.